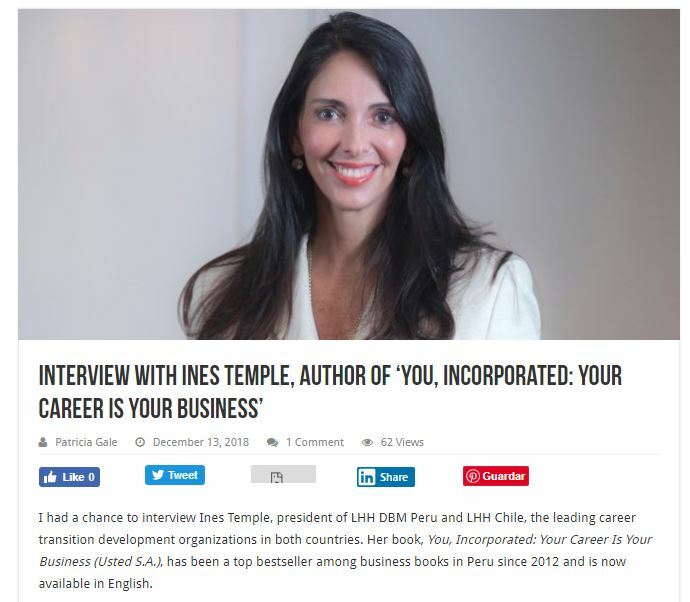 I had a chance to interview Ines Temple, president of LHH DBM Peru and LHH Chile, the leading career transition development organizations in both countries. 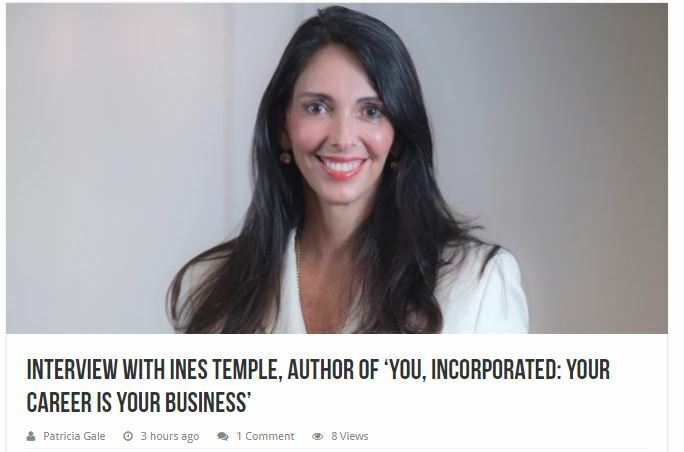 Her book, You, Incorporated: Your Career Is Your Business (Usted S.A.), has been a top bestseller among business books in Peru since 2012 and is now available in English. Why do today’s workers need to continually cultivate themselves? We all have to update our skills all the time, but now it’s especially important with all the changes happening in the world of work — disruptions with technology, artificial intelligence, and automation will affect many, many jobs, and some may even disappear. We need to future-proof our jobs. It’s important that we all remember that we are service providers and are responsible for the level of service we provide. We have to keep up with training, learning and developing professional skills — including and especially our soft skills. As owners of our own businesses — which are our careers — it’s our responsibility to do so to provide the best services possible and keep advancing our employability and the value or our personal brand. Our careers are our most important business; we live from providing services and selling those services. For that, we have to make sure we’re delivering added value, that ideally can be quantified. We need an entrepreneurial approach to our careers because it’s our own best business. Why is it important that we consider ourselves entrepreneurs who provide professional services — even to our boss? We all need to take responsibility for our own employability. Only our level of employability will guarantee that we have a demand for our services. That demand may come from our current employer or from another company. It’s in our interest that we always have a strong demand for our services. That’s the only thing that will allow us security. Job security doesn’t come from having a job, but from having a good level of employability — a demand for our services when we need it and want it. In this changing world of work, we need to make certain that we keep ourselves in demand. That’s the only thing that will guarantee our job in the future. What’s the most important thing to consider in creating our personal brand? The most important is integrity. We need to make sure that we conduct ourselves in both the business world and in our personal lives — and in our online world — in a professional way. Remember that everything we do today may be recorded or filmed. Our digital footprint will never disappear. We have to make sure our integrity is consistent in all areas of our lives. Beyond how we behave, we need to consider where we want to go and how we plan to get there. When we create a strategy to accomplish what we set out to do, it projects an image of credibility. It’s a matter of attitude. It’s a mind shift. If we understand that our career is our business and that our personal brand represents our business, we must make sure our brand will take us in the direction we want to go — toward our goals, dreams and ambitions. How does the act of defining our individual idea of success make us more likely to achieve it? Success is very personalized. The formula for success is different for every individual. Each one of us has to aim toward our personal idea of success. What often happens is that people comply with other’s ideas of success: those of family members, spouses, bosses. In order to achieve success, we have to be completely loyal to ourselves and determine what we really want to do, what we have a passion for, and what we’re good at doing. We all spend much of our lives working, and we need to enjoy it. People who aren’t clear at what they want and who follow other people’s ideas of success need to stop, look inwards and decide where they really want to go and then work at a plan to get there. Once people define where they really want to go and what they really want to do, they’re half the way there. How can we best position ourselves to be competitive in the global market? We need to first understand our sector and our specialty, and try to focus on learning more of where they’re going. What are the potential disruptions? What skills and abilities do people need to be successful in those industries? We all need to become more comfortable with technology. The more we can learning about technology — learning to code, reading about it, taking courses and listening to podcasts — the better prepared we’ll be with what’s coming in the future. If we need to change sectors, it’s better that we make the change sooner than later. We need to start thinking about what’s changing in our own sector in order to stay ahead of the curve. And we need to make sure that our soft skills are very up to date. In a world of machines, artificial intelligence and automation, our most human skills will be more important than ever. We need to focus on working on our creativity, flexibility, emotional intelligence, adaptability, communication skills, teamwork, and more.